NCR is a the common abbreviation for ‘no carbon required’, evolving from the less environmentally-friendly days when we used carbon copies. They are ideal for handwritten invoices, inspection reports, delivery notes or forms where duplicate or triplicate copies are required. Aqueous prints NCR pads in any size, specialising in the standard ISO sizes of A5, A4 and A3. We print our NCR duplicate pads in black ink or full colour on 2 part, 3 part or 4 part sets. We have listed the prices below for some of our popular NCR pads and books, however if you require something a little different please contact us for a quote. Our most popular NCR duplicate products are 2-part, 3-part and 4-part pads (glued at the top), books (stapled and perforated), NCR sets (supplied loose) and continuous forms (for dot matrix printers). As standard we supply sets with a white top sheet, yellow second part, pink third part and green fourth part, however other colours are available upon request at no extra cost. All our NCR pads include FREE design! A5 NCR pads printed in 1 colour to the face (and reverse if required) of each part of the set, with 50 sets per pad. Glued on any edge. Grey board backing and loose writing shield. Add consecutive numbering for £25. All products and prices listed above include: free design; 50 sets per pad; 2-part, 3-part or 4-part NCR sheets, as standard white, yellow, pink, green; standard dimensions of 210mm x 148mm; single colour (black) lithographic print using our state of the art Heidelberg press; glued on any side; grey board backing and loose writing shield; free delivery to 1 mainland UK address. Prices exclude VAT. Turnaround in 7 working days (quicker turnarounds available upon request). 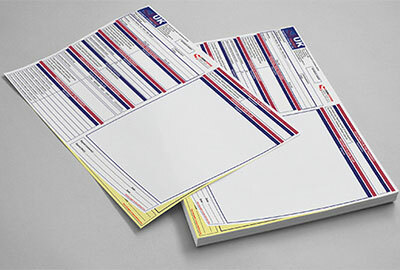 A4 NCR pads printed in 1 colour to the face (and reverse if required) of each part of the set, with 50 sets per pad. Glued on any edge. Grey board backing and loose writing shield. Add consecutive numbering for £25. All products and prices listed above include: free design; 50 sets per pad; 2-part, 3-part or 4-part NCR sheets, as standard white, yellow, pink, green; standard dimensions of 297mm x 210mm; single colour (black) lithographic print using our state of the art Heidelberg press; glued on any side; grey board backing and loose writing shield; free delivery to 1 mainland UK address. Prices exclude VAT. Turnaround in 7 working days (quicker turnarounds available upon request). All our NCR books include FREE design! 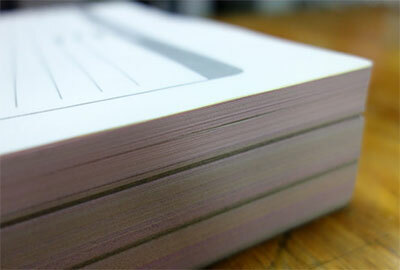 A5 NCR books printed in 1 colour to the face (and reverse if required) of each part of the set, with 50 sets per book. Stapled, spine taped and perforated on any edge. Grey board backing and loose writing shield. Add consecutive numbering for £25. All products and prices listed above include: free design; 50 sets per pad; 2-part, 3-part or 4-part NCR sheets, as standard white, yellow, pink, green; standard dimensions of 210mm x 148mm; single colour (black) lithographic print using our state of the art Heidelberg press; stapled, spine taped and perforated on any side; grey board backing and loose writing shield; free delivery to 1 mainland UK address. Prices exclude VAT. Turnaround in 7 working days (quicker turnarounds available upon request). A4 NCR books printed in 1 colour to the face (and reverse if required) of each part of the set, with 50 sets per book. Stapled, spine taped and perforated on any edge. Grey board backing and loose writing shield. Add consecutive numbering for £25. All products and prices listed above include: free design; 50 sets per pad; 2-part, 3-part or 4-part NCR sheets, as standard white, yellow, pink, green; standard dimensions of 297mm x 210mm; single colour (black) lithographic print using our state of the art Heidelberg press; stapled, spine taped and perforated on any side; grey board backing and loose writing shield; free delivery to 1 mainland UK address. Prices exclude VAT. Turnaround in 7 working days (quicker turnarounds available upon request). Aqueous has been providing our clients with NCR printing and duplicate pads for many years from our studios in Weston-super-Mare and Bristol. We offer all types of NCR printing, including 2 part NCR, 3 part NCR and 4 part NCR print plus other cheap NCR printing or cheap invoice printing on standard ISO sizes such as A6 NCR, A5 NCR, A4 NCR and A3 NCR plus non-standard or custom sizes. NCR printing is also known as carbonless printing, both N.C.R printing and carbonless printing refer to the same products – duplicate sets without any environmentally unfriendly carbon. When you consider that our NCR printing prices, delivery note printing or invoice printing prices include free design, we are certain that we offer the cheapest NCR printing prices in the UK and the cheapest delivery note printing prices in the UK. When you couple our duplicate invoice prices (the lowest carbonless invoice printing and duplicate delivery note printing prices in the UK) with our service, the highest quality materials and free professional graphic design you will never need another NCR printing service.